Yesterday we headed over to Jacksonville to find some lace for my ball gown. I have this idea in my head for adding some lace on my ball gown to make it a little more modest. Apparently the lace in my head doesn't exist, at least not in the silvery gray color that I want. To try and make do, I bought some white lace and some fabric dye. I have never dyed any fabric before so this should be interesting! I am going to attempt it tomorrow! We shopped around Jacksonville for awhile and then ate at Red Robin! I love that we finally have a Red Robin here! I always get their salad and Chicken Tortilla Soup! I need to figure out how to re-create that soup so that I can make it at home! Any ideas for me as to what is in it? 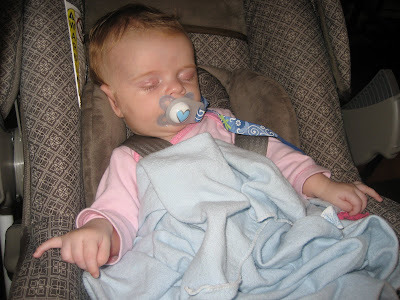 Kenley fell asleep with her pinkies gripping the sides of her car seat while we were eating. 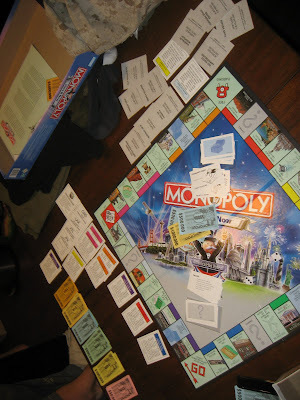 Once we got home we decided to play a game of Monopoly. Brian killed it! In the beginning I had tons of property and was doing really well, but Brian bought all of the airports and it killed me! Most of the game all of my properties were mortgaged. Not very Dave Ramsey. :) After Brian won Monopoly I challenged him to Pinochle. I was leading 134 to 40 but then somehow he made a big come back and I lost at that too! We will be having a rematch very soon! 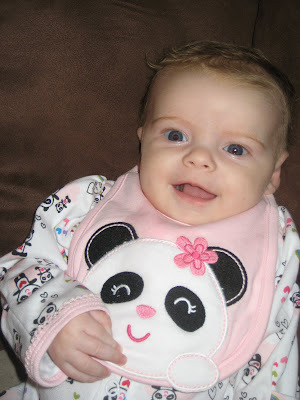 Here are some pictures for my cousin Nicole who sent Kenley this panda bear outfit! The hat that came with it was either really small or Kenley's head is really big because it didn't fit her at all. I think its the big head :) Thanks for the outfit Nicole! We love you! 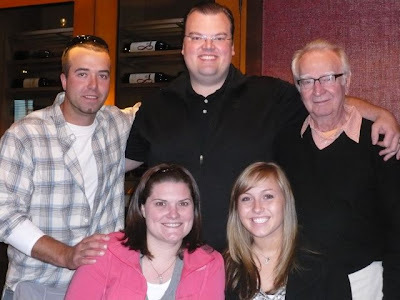 Here is a picture of my Grandpa, Kimbe, and my cousins Sean, Nicole, and Justin! See how cute her bangs are! I love you Kimbe! awe i love you too!! and your bangs look like they just need to grow a little, but they look cute. 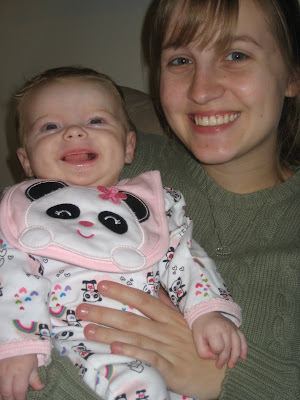 and in that one picture kenley looks like she is holding her own head up pretty well! 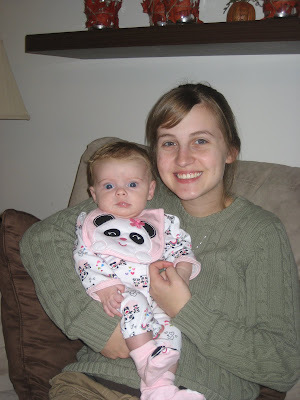 im so proud, shes stinkin adorable! Your blog is simply amazing! I found your link through A Soft Place to Land and have loved checking everything out today. Hard to believe that so many different and absolutely wonderful blogs link up in one place every week. 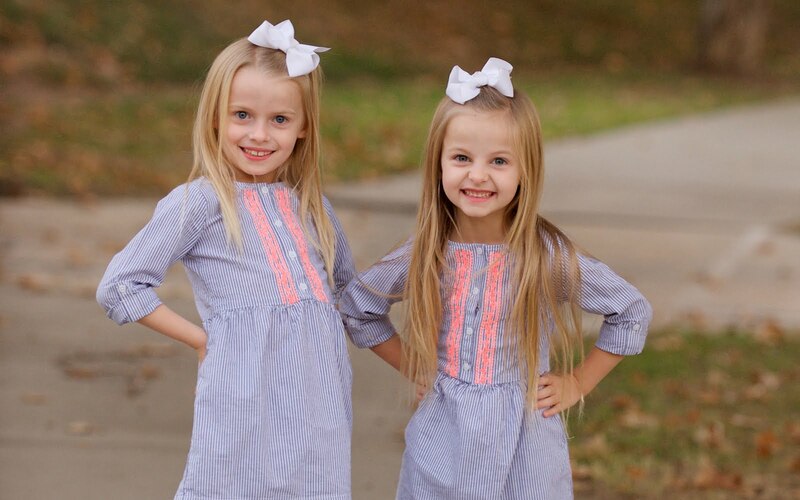 I love my Kenley! She is adorable!! Come soon! 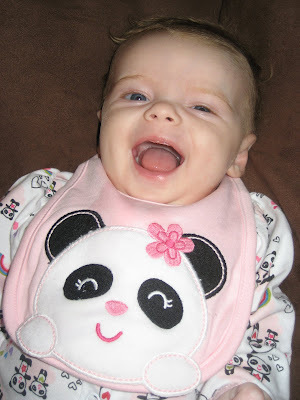 Kenley looks like such a happy baby! She is so sweet. Okay, I have to admit...I have been craving soup ever since you posted this blog! Bake at 425 degrees F (220 degrees C) for 10 minutes, or just until cheese is melted.